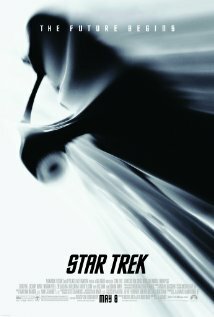 I didn’t expect to like Star Trek (2009) at all. I originally thought it sounded like a cheap gimmick to cash in on a popular franchise. The filmmakers had clearly run out of ideas for continuing the story, so why not leech off what worked in the past? However, when the film finally came out, I started to hear that it wasn’t some knockoff, but it really was trying to bring Star Trek back from the dead in a creative way. So I gave in and watched the movie while it was still in theaters. And what I found thoroughly shocked me. From the slam-bang beginning to the hopeful conclusion, this movie had me hooked and excited to see more. I’m going to share what made Star Trek such a pleasant surprise for me by explaining my background with the series, what I expected from the film, and what it delivered. Along the way, I’ll also address some of the criticisms that have been leveled at this film. So let’s boldly go where many fans have gone before! I’m what you might call a middle-of-the-road Star Trek fan. My first memory involving Star Trek was when I lost a baby tooth while watching Star Trek IV: The Voyage Home on TV. Soon after that, I remember seeing the series premiere of Star Trek: The Next Generation “Encounter at Farpoint” and numerous other episodes of that show when I could stay up late enough to watch them. I especially loved the first half of “The Best of Both Worlds.” I got goose bumps at the cliffhanger when in my child’s mind I tried to picture what the show would be like without Captain Jean-Luc Picard. 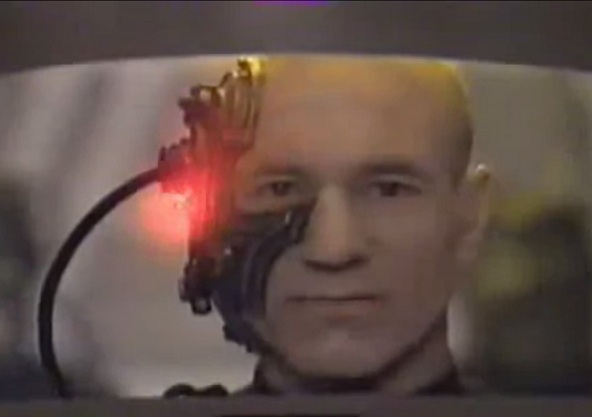 That was a mind-blowing twist for me to have him become a Borg. To make a long story short (too late), I got into Star Trek by watching the movies and Star Trek: TNG. I tried to get into Deep Space Nine and Voyager, but they just didn’t capture my attention the way the TNG crew did. And I didn’t even bother trying when Enterprise came along. I’ve seen a couple episodes of the original series, but I’m too far removed from that generation to get much pleasure out of seeing silly camp from the 1960s play out on screen. So I was probably in the target market for the Star Trek reboot film. I know the catchphrases from the original series, and I’m familiar with who the characters will become in their mature years. I wasn’t terribly interested in seeing Kirk, Spock, McCoy and the rest of the crew in their Starfleet Academy days. But if it meant a new, exciting adventure for our heroes, then I might be willing to give it a shot. When the Star Trek reboot was first announced, I expected it to be some kind of coming-of-age story about a young Kirk facing all sorts of challenges on the way to graduating from Starfleet Academy. It actually sounded pretty boring in my head. Who wants to see how Kirk became a great leader when we’ve already seen him use his honed skills in numerous adventures over the years? His humble beginnings would almost certainly pale in comparison to his later years. 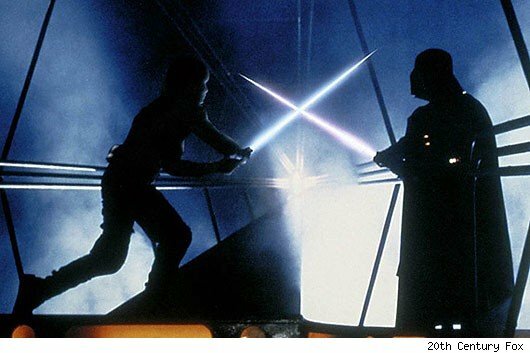 Think Anakin Skywalker in The Phantom Menace vs. Darth Vader in The Empire Strikes Back. One stinks and the other rocks. By the way, I’m sorry to mix my Star Trek/Star Wars metaphors. I heard the story would involve some form of time travel, which was fine by me. Star Trek IV and First Contact were both great films, so I wasn’t too worried about it. As long as time travel is just a means to telling a great story, I’m perfectly fine with it. Honestly, my expectations were kind of high and low at the same time. I had been royally disappointed by the last Star Trek film, Nemesis. I figured anything would be better than that. But I grew up equating Star Trek with high quality, so I couldn’t help really hoping that a lot of thought and effort would go into the newest installment. Thankfully, the film I saw blew away all of my expectations. Michael Giacchino created an excellent score for this movie. The music theme that plays while the Paramount and Bad Robot logos appear on screen is particularly great. I could feel my sense of anticipation going through the roof. It sounds both epic and eerie, and I couldn’t wait to see what it portended. Luckily, it didn’t take long for the film to deliver on the promise of its soundtrack. The opening attack on the U.S.S. Kelvin was unlike anything I had ever seen in a Star Trek film or TV show episode. I was used to the slower and more submarine-like space battles of The Wrath of Khan and The Search for Spock. This was something completely new for me. And I loved it. 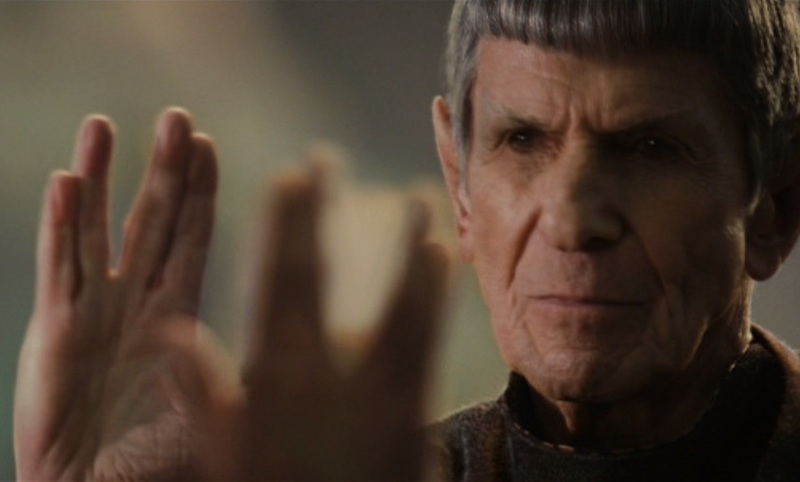 The thing that surprised and delighted me the most was the fact that the film focused so much on Spock. At least as much time is devoted to Spock as Kirk. To me, Spock has always been the more interesting character. He’s a child of two worlds and he’s also an outcast in both of those worlds. He’s constantly on guard against his human instincts while also trying to purge himself of emotion. Even though his intellect is superior to most of his superiors and he’s perfectly capable of taking command, he still defers to them and chooses to live in the shadow of lesser men. I think it’s because he recognizes his own weaknesses. He hasn’t been able to harmonize logic and emotion the way Kirk has. He sometimes lacks the human touch that is so often needed to make it through crises. The fact that this film creates an entire Spock-iverse is the best choice its makers could have made. 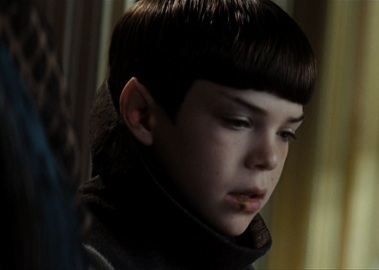 The villain Nero is obsessed with making Spock pay for the destruction of his home planet Romulus. In his quest for revenge, he obliterates the planet Vulcan, kills hundreds of Klingons and Federation officers, and he comes close to destroying Earth, as well. Basically, he sets up an entirely new setting in which Spock is now going to play an even bigger role than he did before. As one of the last Vulcans alive, he’s sure to command more respect in Star Fleet, and his relationship with his crew members will forever be colored by their first adventure together. What a great setup for this reboot. The film never repeats itself. Even when nearly identical situations arise, it finds new ways to present them. A perfect example of this is when Kirk, Sulu and a Red Shirt try to space jump onto a tiny platform hovering over the planet Vulcan. First we see the Red Shirt recklessly wait too long to open his parachute, so he bounces out of control and gets sucked into the beam that’s burning a hole into the planet. This makes us seriously worry about Kirk and Sulu. How will they escape the Red Shirt’s fate? we ask. When Kirk hits the platform, he also struggles to gain control, but he uses his quick wit to close his parachute just in time. A fight ensues between Kirk and two Romulans. Unfortunately, one of the Romulans shoots a few holes into Sulu’s parachute before he can land. So Sulu is out of control and trying to avoid getting burned to death. This scene just keeps raising the stakes and presenting new challenges for the heroes. After killing the Romulans and damaging the platform, Kirk and Sulu face another problem. Sulu falls off the platform, and he doesn’t have a parachute anymore. 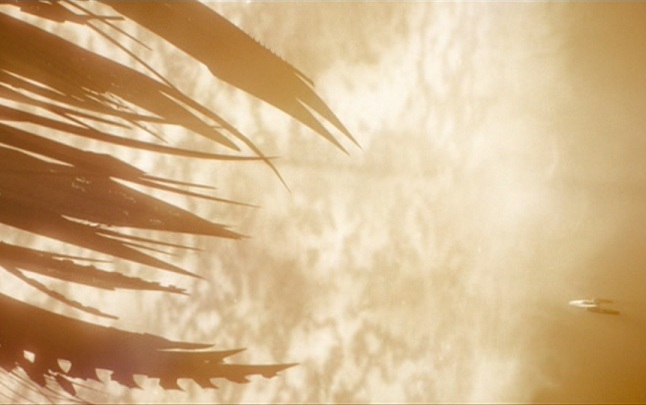 Kirk jumps after him and tries to save him with his own parachute. However, Kirk’s parachute was only designed for a one-time use and a certain weight, so it breaks under the stress of both him and Sulu. So this time there’s nothing they can do but call for help. And so Chekov gets his moment in the spotlight. They’re constantly finding new ways to solve problems. This makes for a really entertaining movie. Some people have complained that Star Trek (2009) doesn’t have a main theme or some sort of Star Trek dilemma, and that somehow makes it an inferior product. I don’t understand why people say that Star Trek films need to be about something, as though each one should have a central message to it. I’ve heard that The Wrath of Khan is about death, The Search for Spock is about life, The Voyage Home is about communication, and The Undiscovered Country is about prejudice. But I don’t see those films in that way. They’re each about a lot of things. Cheating is a big theme in all of those films – Kirk’s cheating death, traveling back in time to get around a major problem, and faking out a murderer to get her to reveal her identity. Age and youth are major themes in many of those films. Complicated emotions are explored, challenges are overcome, loyalties are tested, and much more. How can you sum that all up in one word for each film? You can’t. That’s why it’s simplistic to say that Star Trek (2009) isn’t about anything just because you can’t boil it down to something simple. Star Trek is about sacrificing oneself for others, controlling emotions, overcoming fear, rising to the occasion, thinking outside the box, dealing with family relationships, and much more. Sure, the science involving black holes is a little off, Red Matter isn’t explained very well, Nero’s motivations aren’t delved into deeply enough, and Kirk is a bit of a pompous jerk. But all of those are minor details. The film is a lot of fun to watch. It’s exciting, unpredictable, and full of memorable moments. This movie pleasantly surprised me, and I can’t wait to see what J.J. Abrams and his crew have in store in the sequel. Good work, fellas. Live long and prosper! 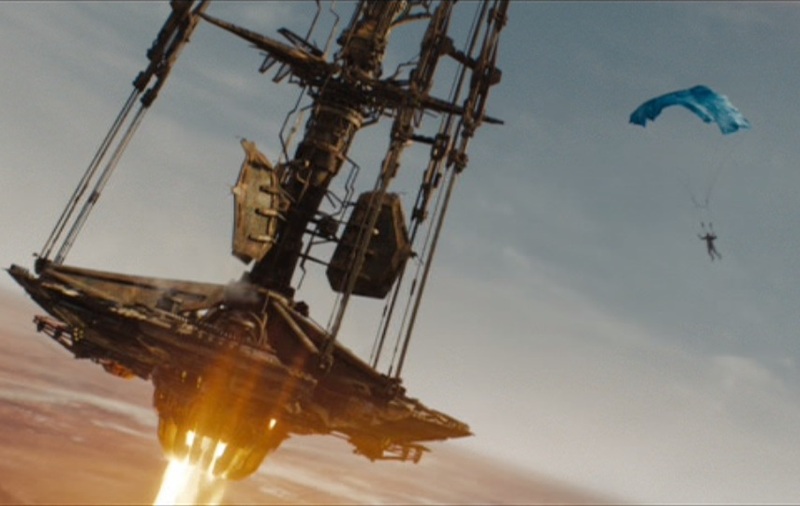 All images from Star Trek (2009) are the copyright of Paramount Pictures. 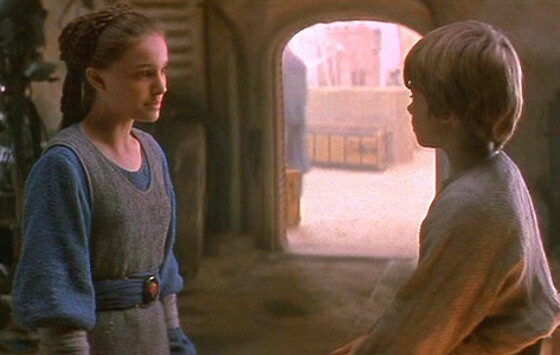 This entry was posted in Pleasant Surprises and tagged action movies, anakin skywalker, clue, darth vader, film score, films, fun, funny, humor, james t kirk, message movies, michael giacchino, movie review, movies, music, relationships, science, science fiction, soundtrack, space, spock, star trek, star wars, TV shows, voyager. Bookmark the permalink. Very good assesement of this movie. Have you seen his show Spaced? It’s a great comedy from the late 1990s. No, I haven’t. Hmm… I’ll have to learn more about it. Thanks for the suggestion!